SUMMIT COUNTY, Colo. – Power has been restored to parts of Summit County after outages closed several schools, businesses and ski areas Friday morning. 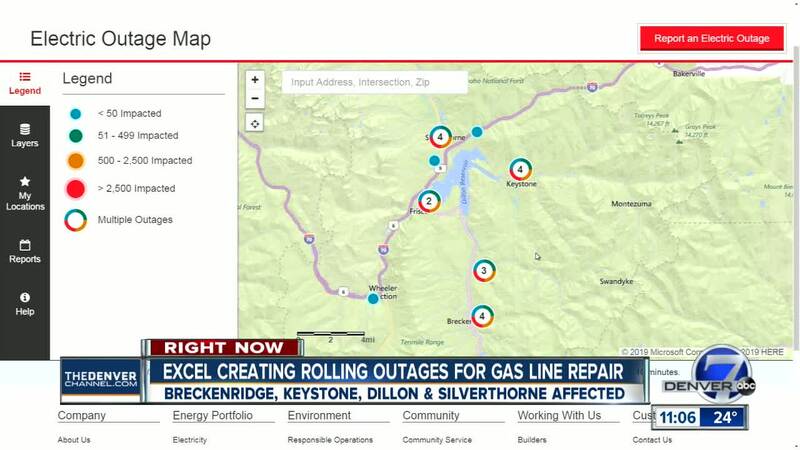 Xcel Energy said it is still working to fix an issue with a natural gas line, which caused more than 17,000 customers to lose power. Around 3:30 p.m., the company said electricity had been restored but they had to temporarily reconfigure its gas system. Xcel spokesman Mark Stutz said the issues with low natural gas pressure countywide was first noticed around 4 a.m. The decision to implement the controlled outages was made around 5:30 a.m.
Customers across the county were seeing 30-minute outages for periods of time Friday, Stutz said. The purpose of the controlled outages was to limit the use of furnaces and other electrical appliances that run on gas to help balance the system while it continues operating at low pressure and to keep everyone's pilot lights running. They still haven't found what caused the pressure drop. Stutz said approximately 17,500 customers were experiencing controlled outages. Both Keystone Resort and Breckenridge Ski Resort were closed for a time Friday morning, as were Summit School District elementary schools. But Breckenridge saw a limited reopening just before 11:30 a.m. There were only a handful of runs open at Keystone as of 11:30 a.m. Skiing / snowboarding remains available only on Dercum Mountain- currently no access on North Peak or The Outback. The Breckenridge Recreation Center will be closed Friday, the town said, but all other facilities will remain open. The company said anyone who smells a sulfuric or rotten-egg-like smell could be smelling an odorant put in gas lines to help detect leaks and urged those people to leave their home immediately and call 1-800-895-2999.